How many times have you bought something that's outmoded in a few months? That isn't going to happen to this ADSL router, primarily because it's not finished yet. 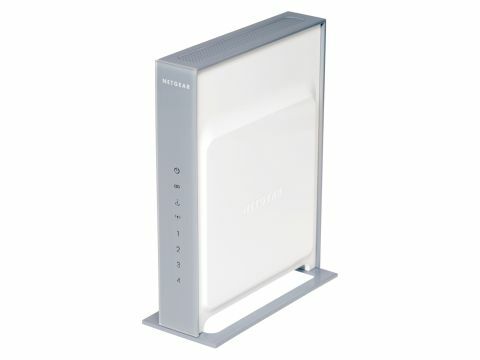 The Netgear DG834N is the new 802.11n-ready version of the market-trouncing DG834G 802.11b/g route. It features the draft release of the as-yet-unfinished 802.11n specification. Buy this and you'll almost certainly be able to upgrade to the final standard when it's ratified early next year. Other than the wireless, which uses Broadcom's new Intensi-Fi Draft-N chipset, the DG834N is for the most part a standard ADSL router. We tested the wireless performance with the WN511B PC Card using the industry-standard ixChariot (www. ixia.com). You'll need to have proprietary wireless adaptors to get the best from kits like these, but this will change when the 802.11n standard has been finalised. In an environment with three other weak wireless networks and a DECT phone, performance wasn't great - around 40Mbps. That's still 15 or so Mbps better than 802.11g, but it's not what we were expecting. Less interference meant better performance though, and the Netgear rose up past the 80Mbps mark eventually in a 'cleaner' environment. That's still underwhelming in terms of the speeds that we've been promised, but it does mean that you can stream HD movies. However, it's in terms of wireless range where the Netgear really amazes. Around 40-50 metres of good range in a builtup area exceeds even what we achieved with the non-Draft-N MIMO kits from 2004/5. Unfortunately, we found basic usability problems setting up the kit. The DG834N timed out when updating the firmware and we had problems getting the PC Card to connect to the router. Come on Netgear, consumers expect more.